We present a new procedure for the translation of propositional linear-time temporal logic (LTL) formulas to equivalent nondeterministic Büchi automata. Our procedure is based on simulation relations for alternating Büchi automata. 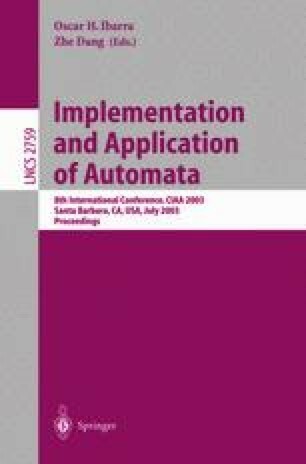 Whereas most of the procedures that have been described in the past compute simulation relations in the last step of the translation (after a nondeterministic Büchi automaton has already been constructed), our procedure computes simulation relations for alternating Büchi automata in an early stage and uses them in an on-the- fly fashion. This decreases the time and space consumption without sacrificing the potential of simulation relations. We present experimental results that demonstrate the advantages of our approach: Our procedure is faster than TMP but produces, on the average, automata of about the same size; LTL2BA is faster than our procedure but produces larger automata. Supported by Deutsche Forschungsgemeinschaft under project no. 223228. AT & T Labs-Research. Graphviz. http://www.research.att.com/sw/tools/graphviz/. R. Bloem. Wring: an LTL to Buechi translator. URL: http://vlsi.colorado.edu/~rbloem/wring.html. K. Etessami. Temporal massage parlor. http://www1.bell-labs.com/project/TMP/. C. Fritz. Home page. http://www.ti.informatik.uni-kiel.de/~fritz/. C. Fritz and B. Teegen. LTL → BA. http://www.ti.informatik.uni-kiel.de/~teegen/ABA-Simulation/ltl.cgi. C. Fritz and Th. Wilke. Simulation relations for alternating Büchi automata. Tech. Rep. 2019, Institut für Informatik, Kiel University, July 2002. Extended version. Available at http://www.ti.informatik.uni-kiel.de/~fritz/TechRep2019ext.ps. G. J. Holzmann. The SPIN homepage. http://netlib.bell-labs.com/netlib/spin/whatispin.html.